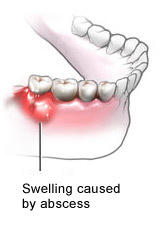 Have you ever heard of the word “abscess” and wondered how it relates to dentistry? Perhaps you were once told by your dentist that you had an abscess or know someone who has had one. Abscesses are quite common, in fact, about 40% of our patients have had one at one time. Below are some of the most common questions we field at our office concerning abscesses. An abscess is a localized collection of pus associated with a tooth. A periapical abscess is the most common form of abscess and it is when the pus is located at the bottom of the tooth roots, also known as the apex (see figure 1). 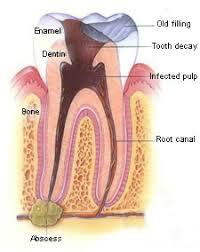 A root canal is generally required to drain the pus and remove the infected pulp of the tooth. If the pulp is not removed then the abscess could return. An abscess will not go away without a dentist’s intervention. However, the pocket containing the pus can rupture. This will give you a temporary relief from pain because the inflammation is not pushing up against the nerves of your tooth. However, if the pus is drained prior to allowing the dentist to do it the body will absorb the infection and it will spread further. Symptoms of a dental abscess include but are not limited to a persistent throbbing toothache, sensitivity to hot and cold and swelling and tenderness in the face. If you are having any of these symptoms, you should make an appointment to see your dentist. An abscess is very harmful to your health if left untreated. 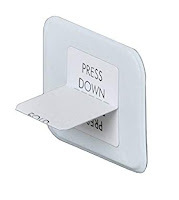 If you cannot go to your dentist or the emergency room, you can use a cold pack on your face to reduce swelling and ibuprofen to reduce inflammation. Once your dentist gives you an antibiotic, make sure you take the entire course of medication. If you stop early just because you feel better, the infection could return. If you are experiencing any of these symptoms or you think you may have an abscess forming call your dentist right away. If you would like to speak with someone regarding additional questions, feel free to call our office. Our staff members are trained to answer all of your tooth abscess needs.